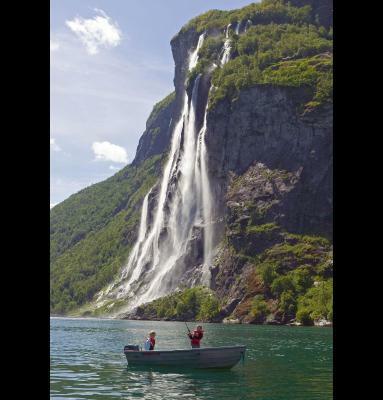 Lock in a great price for Geirangerfjorden Feriesenter – rated 9 by recent guests! Everything! The location, facilities and the view! Good price for your own cabin with kitchen, double bed, modern and clean bathroom. Also, a terrace! It was raining when we arrived, though it hasn’t ruined our stay. Also, if you plan to stay there, bring all sorts of food including tea, coffee, sugar, salt and stuff with you. It has all the kitchen ware to cook all sorts of food. 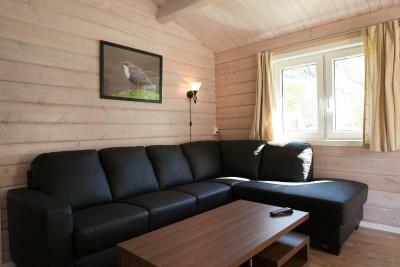 Spacious two bedroom cabin overlooking spectacular Geirangerfjord. Nicely renovated and very comfortable. Everything you need in the kitchen and a nice patio outside. The cabin is not large, but still was cozy and comfortable and had everything we needed. Glad I choose to stay in the cabin rather than a hotel. Right on the fjord, view is amazing. Peaceful, quiet, on the outside on the town but within walking distance. Great location, excellent facilities, welcoming service, highly recommended. Magnificent views. 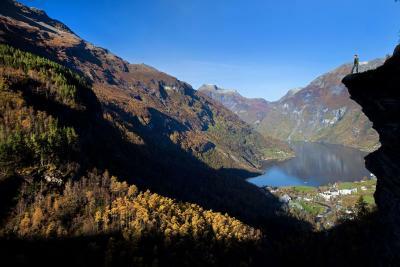 Very nicely located on the sunny side of the fjord, 20 mins by foot along the road from Geiranger. 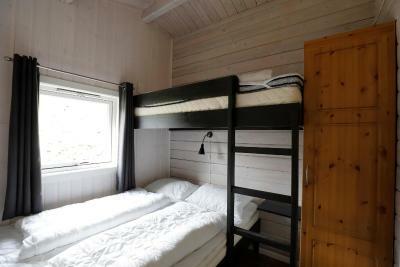 Cozy, clean and well-equipped accommodation with nice fjord view. Beautiful scenery. Amazingly located on the banks of GeirangerFjord. Best views all around, with pear and cherry tomato trees surrounding the cottage. The view of the Fjord is breathtaking and you could spend an entire day just sitting on the pier. Boat rental is also possible so that you can visit the seven sisters waterfall up close..and generally muck about on the Fjord.. beware of the waves created by the ferry though :D.
Overlooking the Geiranger Fjord where the Eagle Road begins, this holiday park is 1.2 mi from Geiranger Ferry Terminal. 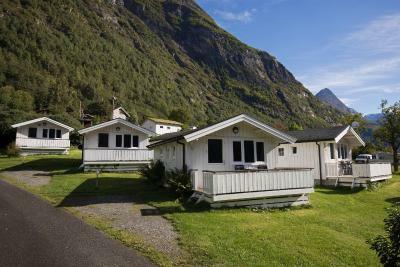 It provides self-service cottages with free WiFi access, a kitchenette and fjord-view terrace. 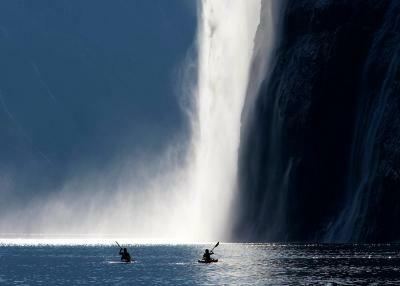 The Seven Sisters and The Bridal Veil waterfalls are a 10-minute boat ride away. 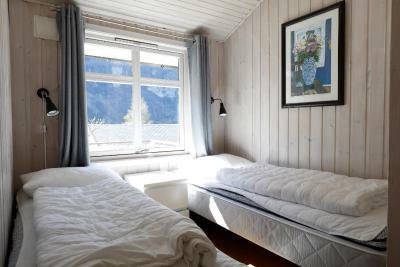 A seating area with sofa and a bathroom with shower are standard at Geirangerfjorden Feriesenter's cottages. Some include an LCD TV with cable channels. Communal facilities include a laundry room and a garden with playground. Motor boats and fishing equipment can be rented on site. Staff can recommend surrounding hiking trails. The Flydalsjuvet cliff top viewing point is 1.9 mi from Feriesenter Geirangerfjorden. Storseterfossen Waterfall is within 45 minutes’ walk. Ålesund Airport Vigra is 62 mi away. 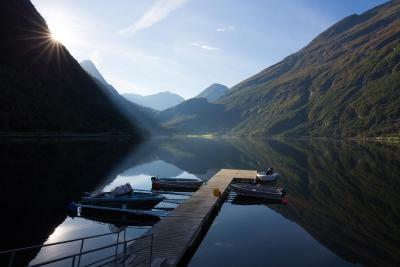 When would you like to stay at Geirangerfjorden Feriesenter? - Kitchenette with stove, microwave, fridge and coffee maker. - Kitchenette with 2 cooking hobs, a microwave, fridge and coffee maker. Some of these cottages have space for 1 extra bed. House Rules Geirangerfjorden Feriesenter takes special requests – add in the next step! Geirangerfjorden Feriesenter accepts these cards and reserves the right to temporarily hold an amount prior to arrival. Nothing.. just didn't like the fact that we could only spend 1 night here. The view of the fjord was incredible and the cabin was spacious and comfortable. We loved our stay there. Good stay here. Staff is really kind and helpful. Good view from the stay. Good Location, we can see the nice rever view from the window. People fishing at the water shore in direct sight from the cottage. This was one of the best cottages we've stayed in during our one month trip through Finland and Norway. We stayed in a comfortable and light superior cottage and it was a wonderful experience, even though the weather pretty much sucked most of the time. The cottage was very clean, easy to heat, the shower was nice and warm, there was plenty enough of hot water for 2 persons to shower comfortably and do the dishes, the view was more than amazing and the sofa and beds were very comfortable and cozy as well. You can hire boats to see the waterfalls and the staff was very nice and helpful. The road 63 to our following destination was closed so we had to turn back and they helped us with planning another route. We would definitely recommend this Feriesenter to others! They also have camping facilities if you want to arrive with tent, caravan or camper! It's not an easy walk to the town because of the narrow, busy road. Fortunately we had a car so this wasn't an issue for us. Everything. Great position and facilities. Staff extremely helpful. We also hired a boat from the office. It was a fabulous stay. Very good location , on the fjord shore , nice cottage with all that's needed. As it was a little out of town, it was sad that no walking trail was available to walk in safely. Right on Geirangerfjord the views were amazing. We particularly enjoyed the breakfast bar where we watched the ferries travel to and fro.